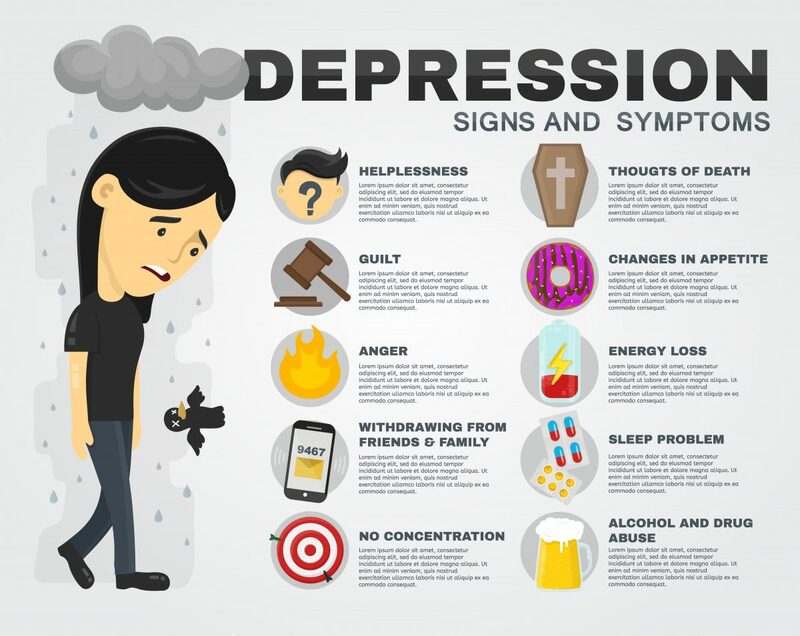 Signs of Depression can be experienced at any stage during the lifecycle and depression itself can be experienced quite differently by each individual. This is why it is sometimes difficult to see the signs of depression and to detect the symptoms. It is expected that one in five Australians will experience some form of depression during their life time. With significant statistics like this, it is extremely likely that depression will touch each of us whether it be directly or through a family member or friend. As a result, it is vital that we take the time to understand the signs of depression so that we are able and active to assist when the time is needed. Do grief and sadness differ from depression? Naturally during life there are times we all experience sadness, grief and loss. However, this does not mean that these feelings will lead to depression but it is important to monitor symptoms and understand how they impact the individual and on their behaviour. But what happens when sadness and grief extends for extended periods of time with no relief? We understand there are stages of grief that one typically goes through including; shock, disbelieve, sadness, and finally acceptance. Some may get stuck on the sadness of loss and may eventually start to display more serious signs of depression. The signs of depression are fairly extensive and cover a wide area but we have tried to break them down here. People with depression may not display all of the signs of depression. They may have a few signs and some people may disguise them very well. Negative thoughts. Negative thinking can start to take over and become the most prominent thought process. In someone suffering Major Depression, we see a gradual removal of any positive thoughts and see a pervasive negative view point. People can start to think negatively about themselves and or the work around them. Typically, people suffering depression start to feel the world is a bad place. They believe they only have stress and bad things to offer, leaving the individual feeling hopeless about the future. Alternatively, feelings of guilt and worthlessness directed at the individual themselves can take over ones thinking. For example, when the person feels down and talks negatively about themselves and repeatedly puts themselves down they aren’t able to see any positives that may exist in the situation. Any possibilities for improvement in the future are also blocked out and for loved ones around them it is often difficult for them to explain how things can improve and get better. They tend to self-blame for most things that go wrong. Negative thinking can be difficult to illicit. Getting a window into the individual’s thought processes is sometimes very difficult, even for a professional but it is important to determine how the individual is speaking and what they are expressing. This is why it is important to encourage the person to speak, even if it is about everyday things as it is important to look for overly negative perceptions. Social withdrawal and isolation. Similarly, to the above thinking, someone suffering major depression often is consumed, by the constant feeling that people have let them down, leading them further into a slump. Even with reassurance that this wasn’t the case, the person may take disappointment and rejection personally. As a result, the individual finds it difficult to bounce back from this. This type of thinking often leads to social withdrawal and isolation. Social withdrawal and isolation is a symptom that may in fact be more obvious to detect than negative thought processes. Tiredness – one symptoms of depression is a physical tiredness. Being a physical symptom, this again may be easier to recognise. This is an overwhelming sense of fatigue or tiredness that makes it difficult to get motivated about anything. Even the simplest of tasks becomes difficult because of a lack of energy or enthusiasm. Such waves of tiredness and exhaustion may be long lasting preventing the person to continue on with day to day activities, go to work or to complete projects. It may also contribute to withdrawal and isolation as they feel powerless and lacking energy to commit to events or being involved in social situations. A change in routine or not participating in activities or events that the person would usually enjoy. The person may be acting differently and out of character. Some people display signs of risky behaviour, they might not consider the consequences or show any care to how their behaviour may affect their life or others. Particularly a clear sign, if they are reckless and displayed behaviour is out of character. Behavioural changes may look different at different age groups but could include; reckless driving, road rage, increased irritability, stopping activities like attending the gym or social gatherings, increased drinking or drug use, poor work or school attendance. Poor Decision Making – the person finds it difficult to make simple decisions and they struggle to get through regular day to day tasks. Whether it be at school, work or home, tasks remain unfinished. Feelings of dread occur when regular routine tasks, jobs or even new tasks need attention, or if a deadline looms. General Unwellness – in addition to the person feels run down and tired, people can also complain of a lot of physical illness such as headaches, upset stomach, muscle and back pain. Sleep patterns – the person can experience either excessive sleep or lack of sleep. Earlier morning waking is often associated with depression as well as excessive and disturbing dreams. Appetite change. Depression can be associated with either excessive appetite or appetite loss. Self-care. When depression gets more severe, a person can start to feel less motivation to worry about their appearance and can tend to put little effort into thier presentation, cleanliness and personal hygiene. Focus and concentration – the person may find it difficult keeping their attention on task and have trouble recalling important things. Regularly forgetting things like dates, commitments, items etc may indicate that a person is not concentrating when originally processing the information because they are distracted by preoccupied thoughts. Feeling numb. The person may lack emotion or feeling. They may also find gaining pleasure or enjoyment from things difficult to achieve. Worrying excessively about everything and everyone. Particularly about things that you have no control over. The person may feel guilty and responsible about matters that they shouldn’t. The worrying may further create anxiety and overwhelm fuelling a vicious cycle. Alcohol and drugs – alcohol or drugs or both mixed with mental illness like depression are toxic and potentially life-threatening. This cocktail can certainly exasperate problems and make matters worse. It makes recovery a long and often more complicated process. Mood – regularly finding yourself in a poor mood is a good indicator. You may find people annoying and irritating. You may find that you become easily frustrated with people and can lose your cool very quickly snapping and getting angry at others. Suicidal thoughts – if the person is preoccupied with thoughts of death and ending their own life then the urgency needs to be lifted immediately. If the person has a suicide plan of how they choose to end their life it is vital proper professional help is sought quickly. From time to time we can all probably tick some of the items listed above and it is important to know that this doesn’t mean you are depressed. But if these signs go on for extended periods of time or you find more items above are relevant then it’s important to seek help from a professional. If the person has suicidal thoughts and shows no other signs of depression, do not wait. It is extremely important to seek urgent medical attention if the person is suicidal. There is no time to waste, should this be the case. Emergency departments and area mental health teams can provide this type of specialised medical service. If you have been admitted into a psychiatric hospital previously it is worth contacting them directly to see if there is availability. It is important that we all take suicidal thoughts, conversations and behaviours very seriously. Knowing and understanding your situation provides you with the power to do something about it. It’s important you treat depression like any other physical illness and get a professional diagnosis and treatment plan. A psychiatrist can help you with this, however, you will need a referral from your General Practitioner. Working with a professional to understand your depression is the first step in working toward a treatment plan that is right for the individual. It also may take time finding available medical professionals who you like and trust. It’s your health and you really do want the best for you so spend time researching your treating team and get referrals from people you know. Those who have been down this track can be great support for a person with depression as they can help them navigate their path through the mental health system in their local area. They can provide them with medical professional contacts, treatment programs and just be listening ears to help them through their recovery journey. Some GPs may use screening tools such as The Goldberg depression self-test that can help provide an indication of how sever your depression is. Repeating such tests can also allow your doctor to assess how well you are responding to treatment, in addition to this, it is important for you to continue to monitor your mood and other symptoms. Often using a diary and making a brief note about this daily can help track your progress. If you are attending an assessment with Sydney TMS we ask you to send it bring with you not only a referral from your doctor but any additional information you may have to help us understand your journey with depression. This can include the list of doctors you may have seen, different treatments you may have tried and what you feel might be contributing to your depression. In addition to a detailed psychiatrist assessment, we will also complete some of the screening tools to measure the severity of your depression. In the past, having depression was referred to as experiencing a breakdown. It was looked at negatively and often not spoken about. Thankfully, times have changed and talking about it and seeking help is part of the recovery process. The more people talk about depression the more understanding people have become. Depression is more commonly recognised these days with one in five reporting experiencing a depressive episode during their lifetime so it’s important that we all gain a far better understanding of it. What you can do to help yourself or someone you love? The first thing is to seek help. You may need support from someone close and its ok to reach out and ask for that support. If you are nervous about seeing a professional, you can always ask someone to come along with you to see your doctor. We all need a helping hand and people really do want to assist. Sometimes our loved ones just don’t know what to do, so its important that we offer them guidance and tell them how they can help. Let people in and be open to talking about what it is that is bothering you. Ask them to be your listening ears and you don’t expect them to offer solutions but just be there to listen to you. Who can assist you with depression? Your family can offer support, they can listen, and they book appointments for you, drive you to places and just be there. But if the signs of depression are still there, you will need to seek professional medical help. There are lots of places you can go to seek this help. We will always advise you to see your trusted GP. They are trained, they have your medical history and they have professionals in your area they can refer you to. They have the knowledge and tools to get you on the right path. Often you may need to rule out other things that might be medically related so that is why at Sydney TMS, we always say start with your GP. A counsellor or psychologist can help with psychotherapy, cognitive therapy, Dialectic behaviour therapy and many other talking therapies that are proven to work. They are non-judgemental, unbiased and professionals who are trained to help people with personal issues or problems. They also have the capacity to work with a wider group of people so that the individual receives the full care they require. There are also many help lines that you can call. If its urgent and you need to speak to someone just call Lifeline, they have saved thousands of lives. There are other lines like men’s health line or kids help line. See below for some important phone numbers that you can keep handy should the need arise. We have previously mentioned Psychiatrists but it is important to understand their role and how they can assist. Psychiatrists are trained medical doctors who have received additional training to specialise in psychiatry. They can prescribe medication, provide counselling and can provide other treatments that may be beneficial to your depression. They will also provide follow up treatment advice to assist you with your recovery. There are a range of depression treatments that may help to reduce signs of depression, improve overall mood and quality of life. It is important to first receive a correct diagnosis and visit your GP. Discuss your needs with your GP and don’t be afraid to ask for referrals from friends and family members as to who they recommend you see for your treatment. Finding a psychiatrist and or psychologist who has come highly recommended may be key to your recovery. A psychiatrist will provide you with a diagnosis and path forward for your treatment. If you aren’t happy with their diagnosis we recommend getting a second opinion. You will get the best from your treatment if you feel comfortable with your treating professional and trust in their opinion. There is quite a lot of direction, guidance and recommendations you need to take so it is important you value the professional advice. Cognitive therapy, Dialectic Behaviour Therapy are types of psychotherapy or talking therapies that greatly benefit people with depression. These are evidence-based therapies proven to be effective in treating depression. Alternative therapies are also becoming more popular and work well in combination with prescribed therapies, they include art therapy, music therapy, dance therapy, horticulture therapy and many others. Sydney TMS (Transcranial Magnetic Stimulation) offers a specialised depression treatment to people diagnosed with Major depression, Bipolar disorder, chronic depression and severe depression. Those who have tried two or more medications for depression or those diagnosed with treatment resistant depression are likely to be suitable candidates for TMS treatment. Transcranial Magnetic Stimulation (TMS) is a non-invasive, drug-free procedure that stimulates neurones in the brain. A magnetic coil is used to generate pulses to improve symptoms of depression. It is fast becoming a popular treatment option in Australia for people with treatment resistant depression. The TMS procedure itself is simple and relatively pain-free. An electromagnetic coil is placed against the patient’s scalp, near the forehead, so that a magnetic pulse can be painlessly delivered into the part of the brain that is responsible for mood control. Patients are awake during the entire treatment course and can listen to music, watch television or just enjoy the conversation with our staff. The results from TMS therapy have been well documented with indications proving that the treatment stimulates that area of the brain, which has a significant impact on depression levels being experienced by patients. Over one million Australians deal with depression each year. And while the severity may differ, person to person, feeling low day after day is difficult for anyone to cope with. However, standard depression treatments are not always effective, nor are they suited to everybody. 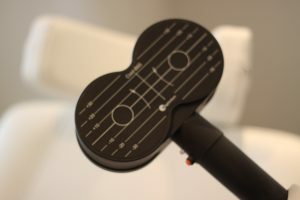 There are a number of benefits associated with TMS Therapy and as mentioned previously it is relatively painless. It is also a medication free alternative, so if meds have come along with unpleasant side effects or did nothing to reduce the symptoms of depression, then TMS provides an alternative treatment option. There are no long-term risks associated with the TMS procedure and it is worthwhile considering before trying treatments like ECT or more invasive therapies. TMS therapy is TGA approved and becoming a very popular treatment option for those who have been living with chronic or long-term depression. If you would like to visit our clinic to gain a better understanding of what is involved with TMS treatment please do not hesitate to contact a team member at Sydney TMS. This television segment provides a good insight into how TMS works and features Sydney TMS. Should you require emergency help, do not wait please contact your local hospital emergency department. If you need to speak to someone call in Australia. For further information about Sydney TMS please explore our website www.sydneytms.com.au or call us today 1300 177 144.